We’re serious about hosting. But you want to know we can really deliver on our promises. 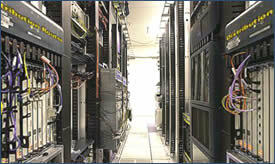 Well, just to ease your mind, GlobalServers uses some of the most powerful server hardware available today. Each GlobalServers web server is a 2.4Ghz dual-CPU Xeon machine, with 4GB of RAM, and a massive 1 terabyte RAID 5 disk array with hot-swappable drives and a hot spare. All servers sit behind a WebScreen Intrusion Detection System specifically tuned to detect and prevent Denial of Service (DoS) and Distributed Denial of Service (DDoS) attacks. Our hardware consists of the highest quality components from top manufacturers: Intel, Foundry, F5 and Cisco. They are industry standard bearers and we’re pleased to use them. You can check out these suppliers at their company websites linked below. 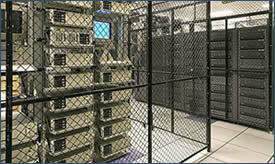 So in case you haven’t seen a data center, here are some classic views. All those servers and networks…it’s a beautiful thing.